Oh BABY!!!!!!! : Stroller for two!!!!!! So now that I know I will be a mommy of two VERY soon I have been on the look out for a stroller for two that I can use with an infant car seat and have Aiden sit comfortably as well. I also need for it to be able to seat both children comfortably once the new baby is out of the car seat. While I was pregnant with Aiden, Paul and I wen to the Atlanta Caribbean festival downtown and we saw two little girls in the COOLEST stroller EVER!!!! They little girls were facing each other and looked super comfy in it. Of course as I was doing my stroller research in the hunt for the best one for Aiden I had come across the stroller but since it was for two I didn't look at it for to long...lol. So when I saw it I was like, "ooooooh so that is what it looks like". 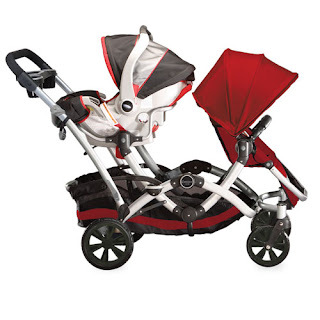 The stroller that I am talking about is the Kolcraft Contours Options Tandem Stroller. And I am SOOOO excited about it. Thank goodness that everything that we chose for Aiden is gender neutral so the only things we have to get are another crib and a stroller to accommodate two children. This stroller is not small by any stretch of the imagination but it will definitely do the job!!!! I played with it at Babies R Us and got a little too into it...I think I need to get a job there...lol. 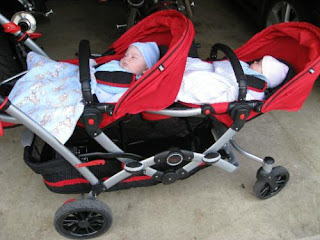 Of course there are other strollers out there but only a couple Tandem strollers (that are NOT sit and stands). The Kolcraft and the Graco DuoGlider were the only two that were comparable to each other. I just love the look and quality of the Kolcraft...the average price online for it is $219 which is not too bad since my Peg Perego was over $300!!!!! 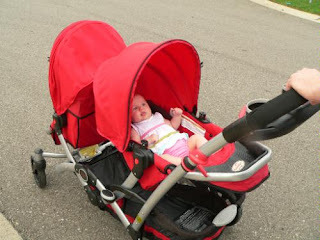 And it comes in Ruby (as seen in the pics) or Not to say that we will always use this stroller but if I am out alone with the two children having two strollers or a side by side is not my idea of fun!!!! 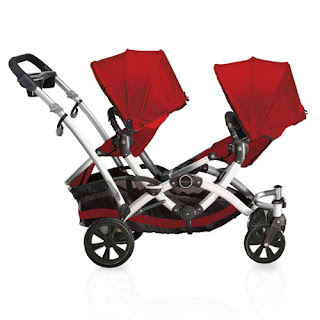 This stroller is PERFECT for someone with twins...ad I mean PERFECT. 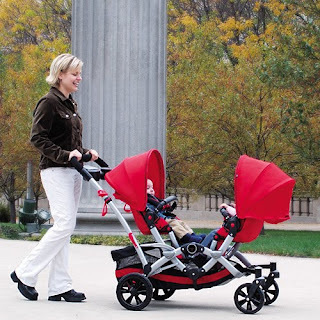 Because you can actually put your infants into the stroller seats and there is support for smaller babies. So you don't have to wait until 6 months!!!!! How cool is that...see the pics below for a visual. That looks so comfortable to me!!!! I sound a little too excited about this stroller don't I? Well I am...I get very pumped about gear for Mommy's (and Daddy's) that makes having a child or more than one child easier on us. Because God knows that having a child is not for the weak at heart...and I can only imagine how it is going to be having two children under 2!!!!!! As I find things for a Mommy of two I will be updating the blog with what I think of the items. But there is not much more that I am expecting to have to buy. We will get a second high chair just like the one we have, no need for an infant car seat because we have that covered, get another crib like the one we have, and eventually get a second Radian car seat. Aiden's blog has been update with pictures from the tree decorating and we will soon put this pics up from Thanksgiving. And lots of exciting stuff going on this month so visit his blog periodically to stay updated!!! Thanks for this b/c I've been looking into this for a couple months and haven't found one that I love for my little ones!